This was a pretty easy decision. PSP’s “player of the week” is none other than a cornerstone of the Philadelphia Union organization, Brian Carroll. 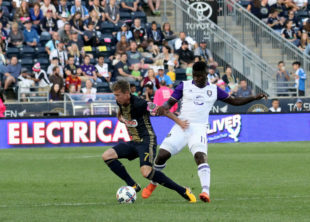 Last week, Carroll played his first 45 minutes for the Union this season. It was also the last 45 minutes of his career. It was a nondescript performance (if only referee Joseph Dickerson had granted the penalty for the “foul” in the box.) Carroll was on the receiving end of a few hard challenges but popped to his feet without any lingering effect. Only former Union forward Sebastian Le Toux has meant more to the organization than Carroll. He was one of the many faces to say his goodbye to the retiring midfielder in the tribute video aired before Sunday’s game. If you haven’t seen it yet, take a look. It’s a better sendoff than anything I could write here. Thank you Mr.Carol! Best of luck in your future endeavors!